Susan Utting-Simon runs an established counselling service from her office in Leeds, UK. She had an existing website, but her BACP hosting was scheduled to end in July 2017. Along with moving her to a new host, we were also able to help her update the written content and overall design of her website. Her requirements were that the new design needed to be modern, accessible and promote her willingness to work with clients both face-to-face and also online (e.g. Skype video calls). Her new website is a customised version of our ‘Professional’ (£425) website template. It has been very well received by her clients and is already generating new enquiries. HACP approached us about updating their public website, directory search service and online event booking system. Working with their representatives we were able to create a fully bespoke design that accommodated all of their technical requirements while also being easy for visitors to navigate and use. 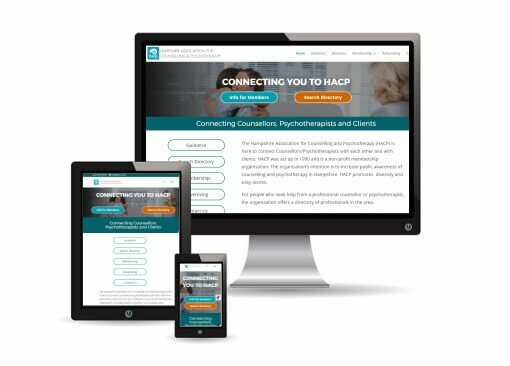 Since launching their new website, both member enquries and registrations have increased along with HACP events being better promoted on the website. Jason is a self-employed builder and wanted a straight forward website so that customers could find him online. It lists the building services he wants to be known for and makes it really easy for customers to contact him, clearly displaying his phone number and by offering a free contact form. We’ve also helped Jason to set up and run his Google AdWords PPC advertising which has resulted in increased customer enquries. 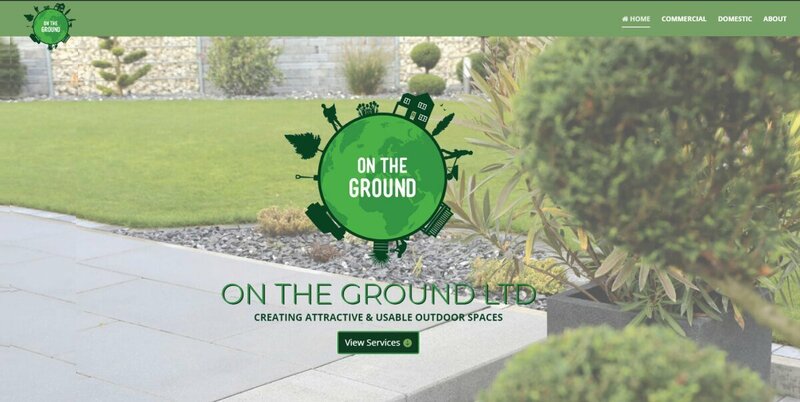 On The Ground Ltd. is a gardening and landscaping company who wanted a minimalist website which introduced their core services and made it easy for clients to contact them for a quote. Their design is based on our ‘Professional’ site template and has been modified to include additional graphic effects. 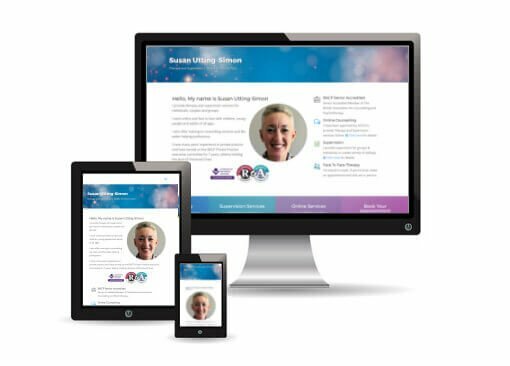 Steve is a self-employed builder and wanted a website that allowed customers could find him online and also to showcase the work he’s completed for his existing clients. It lists the plastering services he offers and clearly shows how potential new customer can contact him by phone, email and free contact form. Steve also has us running a Google Ads campaign in order to promote his business and to make sure that his business is shown to the right people at just the right time when they are searching for business like his. The Google Ads campaign has generated lots of extra work for Steve and he repeatedly told us just how happy his is with the return on his investment spent on advertising with both us and Google Ads. We’re really proud to have helped clients to create the websites that they wanted and help them to promote what they felt were the reasons they stood out from their competition and peers. If you’ve seen anything in these examples which you want for your own website just let us know the effects or design options that caught your eye and we’ll be happy to make you something similar. We’re lucky enough to have had testimonials submitted by a number of our clients and we’ve listed the most recent ones below so you can learn a little more about the difference our website support has made to these businesses and individuals. “I had previously had my website created by a small company via a friend of mine. However, when I wanted to make changes I found that their charges were very high indeed – the ‘industry standard’ they said – and it was all very technical and too complicated for me to do anything myself. I thought I was stuck but Jim converted my whole website to Joomla!, which I can easily edit myself and also set up a shopping cart so I can sell books, CDs and downloadable products. “A dear friend recommended Jim to me and I am so over the moon with what he has done with my website!! He is dependable, trustworthy and reasonable! The [marketing] ideas he comes up with to promote me are right on!! Beautiful flyers for campaigns through MailChimp are just a wonderful bonus as well!! “I do most of the website content myself [but] when I needed to fill in some technical gaps such as; setting up a WordPress shopping cart for selling downloads, removing broken links or when I just needed advice – it was great to have all the technical support I needed and just when I needed it. We found Jim not just a willing helper and very affordable, he’s been a saviour for us so many times. He’s constantly upgrading his own skills and we get the benefit of his knowledge and marketing savvy too. The great thing is I know he’s always there, his response time is within 24 hours and you can also use SKYPE to set up the development strategy together. “I have no hesitation recommending Jim Biddle, he is thorough and conscientious and working with Jim has been like having an in-house member of team who is on your side and thinks not only about the details but about the bigger picture as well. “Alec and Jim updated my website to WordPress and gave it a completely professional and modern look, which promotes my business and targets my clients in a more effective way. “I am happy running my own website and blog site but sometimes need help with adding special pages or something more technical such as mailing list sign-up boxes and getting Google Rich Snippets to work. In these cases Jim has been able to provide the extra support I wanted and still be very affordable. I can do most of the work myself and call up some tech support when I need it. CEO, Operational Excellence Methodology Ltd. When you’re ready contact us and explain what kind of website support would make a difference to your business.